Sinningia leucotricha has the most beautiful foliage of any sinningia. The white hairs that cover the leaves are thickest on young leaves, since the number of hairs is fixed, and they get further apart as the leaf expands. The flowers are relatively small, tubular, and orange-red. Because of the dramatic foliage, Sinningia leucotricha, or "Brazilian Edelweiss" (the name under which I saw it displayed in Frankfurt's Palmengarten), has been a popular plant ever since its discovery. It is also quite easy to grow. Sinningia leucotricha is one of those seasonal species (like, for instance, S. lineata but not S. piresiana or S. hatschbachii) which can sometimes be induced to bloom a second time by cutting off the stems after they have finished blooming. 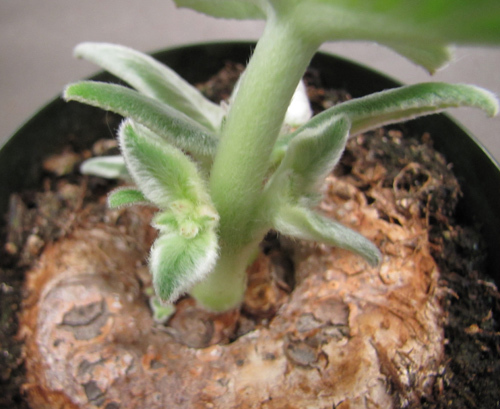 This does not always work, but if there are dormant stem buds on the tuber, they may be stimulated into growth by the removal of the older stems. Propagation of S. leucotricha is usually by seed, since flowering stems of a mature plant seem to be reluctant to produce new plants. Mostly such cuttings do not root. When a cutting of a flowering stem does root, it either produces no tuber or generates a small one which does not sprout after it goes dormant. Fortunately, S. leucotricha is very easy to grow from seed. This picture shows a group of year-old S. leucotricha seedlings, already exhibiting the hairy foliage. The first year, the foliage is very ordinary, and similar to those of (e.g.) S. cardinalis seedlings. There is a picture of a juvenile tuber and foliage here. 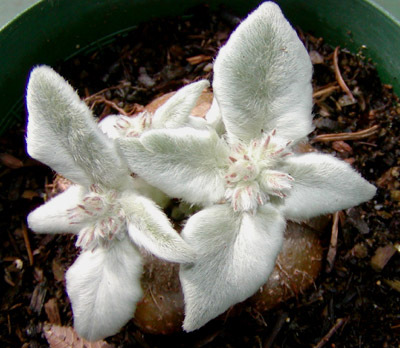 There are a number of varieties of S. leucotricha in cultivation. The standard plant has one tier of four leaves, but there are plants with two tiers. Jon Dixon has a number of plants of this species, and when they flourish, they sometimes get that second tier. There is also some variation in the flowers; the standard plant has a ring of small dark spots at the boundary between the tube and the slightly flaring lobes. Perhaps some of this variation is due to long-ago hybridization. This plant, grown by Gene Sussli of San Mateo, California, shows unusual branching in this species. Usually, the stems do not branch, but here we can see two flowering side shoots off the main stem. Jon Dixon grows a number of variations on S. leucotricha, so I have devoted a separate page to his plants. I believe that S. leucotricha has been crossed with many of the other members of the Dircaea clade. Given the results of other intra-Dircaea hybrids, all such crosses are likely to be fertile. I have crossed S. leucotricha with S. reitzii, obtaining a good plant. I have also crossed S. leucotricha with S. douglasii. 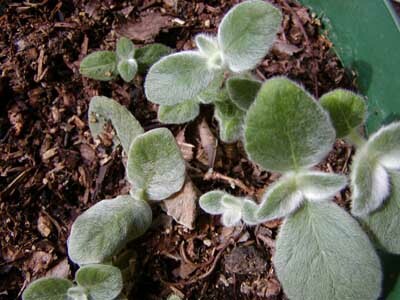 The resulting seedlings have foliage intermediate between the two parents. One bloomed in May 2007. F2 plants have also bloomed, without, however, yielding any real improvement over the F1. I raised seed of this cross from the GHA seed fund. Most of the plants actually turned out to be S. leucotricha, but one was clearly a hybrid: see its page. Jon Lindstrom did this cross and got a hairy plant with piresiana-marked flowers. I did this cross in 2009. See its page. I did this cross in 2010. See its page. Dormancy Stems fully deciduous. Dormancy is obligate. There are a couple of tuber pictures here. Propagation From seed, which germinates well. The seedlings take a few years to mature, but this is the time to take stem cuttings, since stem cuttings from mature plants root poorly if at all. Recommended? Absolutely! Everybody must have a leucotricha! The 1988 AGGS Sinningia Register stated that S. leucotricha is a synonym for S. canescens, but it is now known that they are two different species. 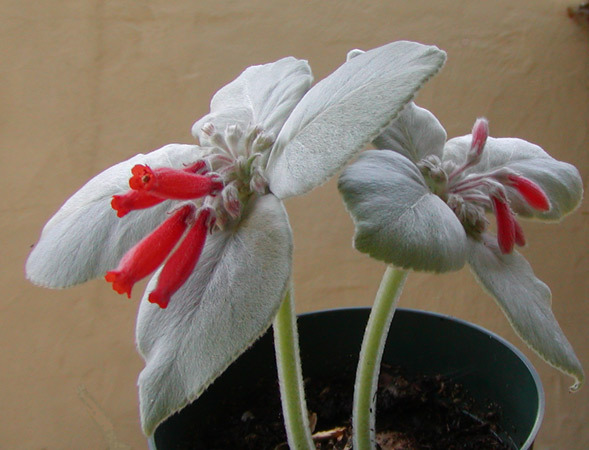 The following information is from the Smithsonian Gesneriad Checklist. Publication (as Rechsteineria leucotricha): Hoehne, 1956 (in the Gloxinian). In 1973, H.E. Moore published this species as Sinningia leucotricha. In 1975, Hans Wiehler decided it was the same as S. canescens. It was later acknowledged to be a distinct species (Boggan & Chautems 1991). Etymology: leuco- ("white") + -trich ("hair").